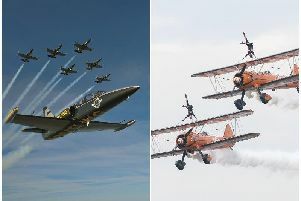 Blackpool Air Show is one of the key events in Blackpool's calendar and this year promises to be another action packed weekend as it celebrates its 110th year. Here's everything you need to know about the event. We'll be updating this article as the event approaches, so make sure to check back for all the latest. When will the Blackpool Air Show take place? The free two day event is set to place place on Saturday, August 10, 2019 and Sunday, August 11, 2019, between 12pm and 4.50pm on each day. What will be the line-up for the weekend? The programme will be headlined by the Breitling Jet Team who will perform over the Blackpool seafront on both days of the free weekend event on Saturday 10 and Sunday 11 August. Has the schedule been confirmed and when are the display times? The display times are yet to be confirmed, with details usually released 2 or 3 weeks before the weekend itself. Blackpool Air Show is a free event. Where is the best place to watch the event? The best viewing points on the promenade between North and Central Piers. Will the Red Arrows be at this year's event? Sadly, the Red Arrows will not be at the 2019 Blackpool Air Show due to a diary clash with their North America nine-week tour in the summer. It's too soon to know what the weather will be like this year. We've got our fingers crossed for conditions similar to the 2016 event.